Above map shows homicides in Oakland between January 1, 2011 and December 31, 2011. Yellow dots represent individual homicides while the colored areas represent how many homicides occurred within a zip code. A number of dots represent multiple homicides. Data sourced from Oakland Police Department. In 2011, there were 103 reported homicides in Oakland. Most of the victims were young black males who were killed with firearms in East and West Oakland. This is a continuation of a pattern in Oakland that has been the case for years and is closely tied to the economic and social realities of young people living in the city’s poorest areas. The number of homicides in the city have been in a general decline since a peak of 145 homicides in 2006, with this year seeing a slight increase from that trend. But if there is anything that makes 2011 different than past years, it is that three of those homicide victims were children under the age of 6. It started with the killing of Carlos Nava, a 3-year-old child, in August during a drive-by shooting on International Boulevard. Then in early December, Hiram Lawrence, a 1-year-old child, was killed in West Oakland from a stray bullet. And finally, Gabriel Martinez Jr. — 5 years old — was killed while with his father outside a taco truck on International Boulevard. The last time a young child was killed Oakland was in 1997, when a 7-year-old child was shot and killed. Those tragedies aside, homicides continue to be largely concentrated in Oakland’s poorest areas — East and West Oakland — and the victims continue to be mainly the city’s black young men. Of the 103 homicides last year, 74 percent of the victims were black despite making up only 28 percent of the city’s population, according to the 2010 Census. In terms of age, 47 percent of homicide victims were 25 years old or younger. Olis Simmons, Executive Director at Youth Uprising, an East Oakland-based youth center, said that when overlapping crime data with economic data, it shows that “all of the failures of society coexist in similar places.” In other words, there is a correlation between the gun violence that claims the lives of young adults of color, she said, and economic and social disparities in East and West Oakland communities, including the lack of markets providing affordable and healthy food, failing schools, high teen pregnancy rates, and high unemployment. The charts below show Oakland’s homicides in 2011 grouped by age, month, time of day, and in comparison to other similarly-sized cities. All data was sourced from the Oakland Police Department. ALSO – if you look at each state code, and when it was passed – you will *sometimes* see a slight “spike” in homicides the following year ONLY, then successive drops after that. The spike is in what are called “justifiable” homicides, where someone defended their own life, at the expense of someone who was trying to kill or harm them. After the “spike year” – homicides of all types simply drop. This is universal. We are seeing this in Detroit right now. Predictions of “bloodbaths” on the street simply never hold true for the 45 or so states that actually allow carry of defensive weapons. Let me repeat – there have been ZERO bloodbaths, but there HAVE been documented decreases in homicides, and this was ALL documented in a book by an Ivy League Economics professor. The book is entitled “More Guns, Less Crime,” and I know the author, since I am active on the topic. I know it is not intuitive, but we need to get past partisan politics, and look at what really works, and not what we are sold. . . Your gun advocacy screed is nonsense, and your conclusions about why there is less violent crime in the chosen cities is silly and unsupported by data. You may as well claim that those places have less crime because they get more snowfall. More guns do NOT equal less crime, and most especially they do not equal less violent crime. Lott, who is a pro-gun advocate, not a disinterested researcher, reaches conclusions that are not intuitive because they are in general not true. He has simply kidnapped some carefully chosen data and tortured it into a false confession. The bad joke about CCW is that the most rabid advocates and enthusiastic practitioners live in exactly the places where CCW confers virtually no advantage whatsoever–homogeneous sparsely populated small towns and rural areas. In such places violent crime in public places, the ONLY possible case where CCW might be useful, is simply unknown. If you run the numbers–and I have–you would find that if you’re a white man over 50 in a small town, chances of being murdered by a stranger are about the same as chances of being struck by lightning. If people really wanted to carry something to save lives, they would keep portable defibrillators in their cars, not guns. IMO the majority of civilians who carry concealed weapons either are victims of 24-hour news cycle terror, or carry a gun for pretty much the same reason that a pimply high school kid keeps a condom in his wallet–in case a fantasy comes true. Where violent crime is rife, most people know how violence works, know that carrying guns provides little protection from violent criminals or crossfire, and most of all, know that putting more guns in circulation means more guns in the hands of people willing to use them for evil purposes, and thus increases violent crime. When the rubber meets the road, pro-gunners, most of whom live in the boondocks, are morons when it comes to the reality of urban crime. Oakland has a lot of needs. Having a bunch of private citizens swaggering around town with concealed weapons looking for trouble is not one of them. Just ask the family of Trayvon Martin. Regarding: Where violent crime is rife, most people know how violence works, know that carrying guns provides little protection from violent criminals or crossfire, and most of all, know that putting more guns in circulation means more guns in the hands of people willing to use them for evil purposes, and thus increases violent crime. When the rubber meets the road, pro-gunners, most of whom live in the boondocks, are morons when it comes to the reality of urban crime. While much of your statement rings true, putting more legal firearms in the hands of law abiding citizens does not put more guns in the hands of “evil people….” I.E., people who own guns, are not evil, rather people who use them for evil purposes are. As far as “pro-gunners who live mostly in the boondocks…”: regardless of ones place of residence, it seems unreasonable to call people who disagree with you morons. That’s rather moronic. In case you hadn’t noticed, a) police rarely stop crime, they generally take reports; b) response time to crimes in progress is unreasonably long in rural areas so in such circumstances, being able to defend your life, family, or property is not moronic, it’s good sense; c) statistical analysis of homicide with guns per 100,000 population could indicate that countries where every home is armed (Switzerland for example) with machine guns or other military weapons, crime is extremely low, and similarly, in states (South and North Dakota, Montana, Wyoming, etc.) where the vast majority of citizens own and are competent with firearms, homicides are also quite low (0.9 or less per 100,000). Firearms are not the answer. Better access to mental health may be the answer in many cases, and giving parents the right to get mental health care for their adult children would also help. Right now if a young man shows evidence of a psychotic break or a tendency towards violence towards others, but is 18 or older, parents, doctors, etc., are powerless to help. Change that and you’ll stop some of the horrible crimes we see. If controlling firearms would stop them it would’ve worked by now. Obviously, viewing statistics, gun control does not prevent criminal activity. Anyone who thinks it does is living under a rock. Where are the stats and overlays you refer to? With or without these, are the areas with the most deaths “wealthy environments”? Please expand so we know if this is evidence based & substantiated, or to be taken as an unsubstantiated editorial comment. What % of murders and other violent Part 1 felonies are solved by Oakland Investigators, and how does this compare to other cities? It would be interesting to have this information. It is often said that a relatively small # of perpetrators are creating a majority of violent crime. Well, if they have little perceived chance of being caught, how can they be removed from the community or deterred? live – I am actually involved in this (I am not pushing the “gun rights stuff” *locally* since that is something that will get fixed at a state level). I work with various coalitions (including the folks who wrote this), and I try to help people see points of commonality with other groups. What we are doing right now is working to kind of unite the various anti-violence groups here so that we work in a logical and cohesive fashion, and ALSO so that the fix for this reflects a consensus of what people in all parts of Oakland agree WILL work. It also helps prevent us from working cross-purposes, and also keeps us from wasting time fighting EACH OTHER, etc. . . I watch it when I want to laugh. The harsh reality is that everything has been tried (more carrot, more stick, less carrot, less stick, etc.). Nothing has worked yet, consistently. The vision that some of us are seeing is that the only way to fix violence is to restore our local economy. This IS something that all rational people seem to agree on. A rising tide lifts all ships, and it’s a LOT EASIER to sell folks on the concept of jobs, than it is on the concept of more helicopters, shotspotters, SWAT vehicles, assault rifles, etc. . . I, PERSONALLY, would have no problem paying slightly more taxes, IF I KNEW that that money would be used as seed money to get some real (non-fast food) jobs here in Oakland for our brothers and sisters. The other thing that people are agreeing on is that we DO NEED more wrap-around services, especially for re-entry people. AND, we need to start doing more of what is called restorative justice. Basically, that’s when people who have done something wrong (and it’s not too serious) are given a chance to make amends to the people they have harmed. My friends in OPD (and I have friends in OPD, city hall, and literally the street) tell me that they would simply like to become normal cops again, and I agree with that. Right now, they have so many rules, that they have to write an extensive report after they do just about everything except take a crap. And that’s not right, either. We are not Berkeley, and we are not SF. We ARE OAKLAND, and Oakland can fix itself, if people listen to us. . . This is a good question, and it would also be a good question to ask OPD how many investigators they have. I got those figures for you. Out of the 103 homicides reported, OPD cleared 23 of them. wow, nice. do you happen to know the number of investigators? and/or how this compares to other cities, such as the ones you’ve compared the homicide rates to above? Thank you John for the follow-up. Wow. That’s abysmally low. How can they be a deterrent if perpetrators are found in such low #’s? Importantly, can you also get the #’s for other serious Part 1 crimes? I 2nd the other Q: How many investigators does OPD have, and what is their current allocation (murder, IAD, etc.)? PS. Thank you for following up on these important Q’s. They are not generally known or covered by the traditional press, but are important to finding solutions. Most of what you have identified as “Piedmont” is actually “Oakland” (94611)–in fact, “Oakland North”–thus reinforcing the stereotypical notions of “Oakland” and “Piedmont”, and that Piedmont Ave. is in Piedmont. You should mention in the text that this large, vital part of Oakland is, in fact, in Oakland and homicide free. There is little direct correlation between short term crime statistic fluctuation and short term economic trends. The correlation is between chronic crime and long term discrimination and chronic high crime levels above the average at all times. There is a pronounced correlation between the economy and crime statistics, over the longer term. Notice that there is a pronounced dip in murders in the late 1990s, when the economy had been growing for a protracted period. Crime tends to be a lagging indicator, in that it generally reflects what the economy has been doing in recent years, rather than what the economy is doing in the present. 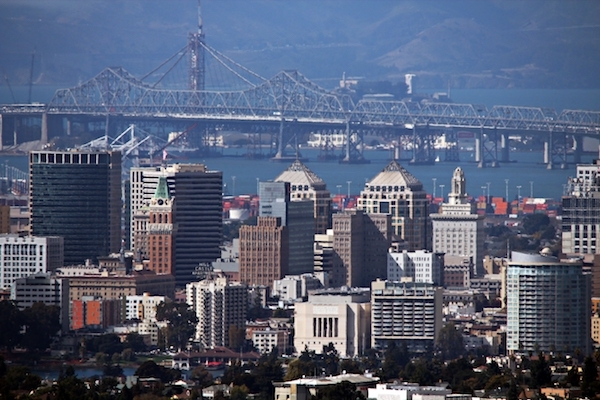 In recent years, Oakland has been becoming more affluent. Many of our new residences have been hollering about how bad the crime is. Actually, crime is less in Oakland than what it was. It’s a matter of perspective. If you come from somewhere that has little crime, you become wide-eyed when you move to Oakland. If you live in a relatively high crime area for a long time, then you can notice when crime goes down a bit. When communities come together for united action for social justice, crime often recedes. This was demonstrated during the Occupy Oakland encampment, when crime downtown dipped 11 percent. Thank you, John, for pointing out that most of the victims of homicide are young black men. This is really important. Even if OPD wants to say that that the murder of small children is sad- and of course it is- the killing of young black men is also really sad. Sometimes I feel like Oakland- citizens, government, and police alike- don’t really care of “those people” keep killing each other. Young black men are victims, not just suspects. Couple of clarifying points- there has never been any demonstrated correlation between crime and unemployment at the US City level, nor nationally. Except for domestic violence, this is the only major crime that has a similar pattern to unemployment trends. We did some analysis comparing Oakland and San Jose crime v unemployment a couple years back too, no connections. Correlation only means so much anyway. The OPD homicide clearance rate is roughly 40% over time- the 23% figure may be correct for the past year, but most homicides don’t get solved to a completed status in the same year, sadly yes. This is a low figure, it’s similar in Richmond, CA also. I’m also confused by Olis’ statement, it’s not correct or it’s been misquoted, either way poverty and crime are solidly connected in the USA. race and crime are not correlated, poverty is. Just happens that the poor in Oakland are predominately people of color. Oh, because 40% is good? How much time does it usually take to get that far, and how does that compare to other cities? And what is the clearance rate for other Part 1 crimes? 1. we do not have a lot of cops, and many crimes are simply ignored. This sends the message to the “bad guys” that they won’t be caught or prosecuted. Also, the cops tend to react to little things like drug possession and parking violations rather than concentrating on homicide and other serious crimes. 2. lots of young people in the bad neighborhoods turn to gangs, either because they feel they need to for protection or because they don’t see any other opportunities for themselves. Then they’re sucked into the violence, and they’re taught that it’s acceptable. The city doesn’t use enough resources to help them channel their energy into better things. 3. all the “bad guys” have guns because they can easily get them illegally, but most law abiding citizens do not have guns. 4. we have a lot of apologists for the criminals, most of whom live in the relatively safe neighborhoods up in the hills. It’s not “politically correct” to go after violent criminals here (literally or verbally). Indeed. The “Civil Rights” movement of the 1960s is characterized as the moment of liberation for African Americans. In point of fact, all dispassionate statistical analyses clearly demonstrate that African Americans, as a group, are worse off now than they were before social liberalization and the rejection of traditional morality. Perhaps Simmons ought to retread Plato’s story of the men living in the caves. If all you look at is the experience of Oakland, where we have a murder rate of 25-30 per 100,000 population, that we have poor living in close proximity to wealth, it is absolutely not true these circumstances cause the high murder rate. Consider New York City. The poverty rate in Oakland is 18%, while in NYC it is 21%. Ergo, they have even higher rates of poverty than here, and certainly they have far greater concentrated wealth than here, particularly in Manhattan. Their murder rare is 5.5 per 1000,000, lower than here by a factor of 5. I.e. if we had their murder rate, we would have less than 25 per year instead of 100-130. Quite a variation. And yet higher concentration of poverty and higher disparity. Therefore this person’s conclusion is pure and unadulterated nonsense. Spike knows his stats. The non-profit he works for was the one who used to compile stats for OPD but was not biased towards cops. I can fully see why different unemployment/poverty rates don’t explain Oakland’s high rate of violent crime compared to other cities. But i can’t see how the extreme poverty of parts of Oakland don’t cause high levels of property crime in all cities with similar stats. That was a very odd closing quote from the head of one of Oakland’s biggest recipent of Measure Y anti-violence funding. Please get a clarification. Our local officials join the national cries for gun control as a distraction from from their failure to make Oakland at least as safe as many cities with similar demographics that all face the same national and state gun control laws. For people raised in ghetto conditions with drugs, liquor stores, guns and traps on every corner as the norm and a police force from a combat zone you get what most US inter cities do today. The elements as they are called are brainwashed to think the party never ends while the police sweep the streets.